“I will surely not be a candidate for any office in 2020,” United Nations Ambassador Nikki Haley wrote in her letter of resignation, closing off speculation before anyone could even ask. Much of the focus on Haley’s surprise resignation announcement has focused on the inexplicable timing, and the fact that President Donald Trump’s administration is losing a prominent and well-respected female representative when Haley leaves the U.N. in the coming months. Also of note: The decision by Haley – once a Marco Rubio-for-president supporter - to rule out a national run in 2020 essentially closes out the (admittedly always-remote) threat of a palace coup confronting Trump on his road to re-election. Elsewhere around the landscape, Mitt Romney is set to join the Senate with no ill will toward Trump, as he made clear at his debate Tuesday night; Sen. Ted Cruz is getting a campaign boost from Trump in Texas later this month; and Sen. Lindsey Graham is more invigorated than ever in support of the president, even fundraising off of Brett Kavanaugh’s Supreme Court confirmation. Trump can count on relative peace inside his Republican Party in the run-up to the midterms. One big question is whether he can still count on it immediately thereafter. With the Supreme Court confirmation fight now over, candidates and voters are picking up the pieces and re-tooling where necessary in the final stretch to Election Day. For Democrats that means, in part, a big push to turn the focus back to issues they’ve been running on all year. Over the weekend, House Democratic Leader Nancy Pelosi sent a letter to her colleagues saying Democrats must “own October” by continuing to talk about a “For The People” agenda centered on health care and prescription drug costs, stagnant wages, and infrastructure needs. Minority Leader Nancy Pelosi speaks outside the U.S. Supreme Court as activists hold a vigil in opposition to U.S. Supreme Court nominee Brett Kavanaugh in Washington, Oct. 3, 2018. On Wednesday, ABC News’ Ben Siegel reported that House Democrats plan to unveil a new series of state-level reports they say show how working families are still struggling under these economic burdens despite other, high-level positive indicators for the economy. The first one is focused on Pennsylvania ahead of the President's visit to the state. In the Senate, too, Democrats are trying to highlight economic issues by trying to force a vote on the administration’s short-term insurance plans. Democrats call them “junk plans” that will rip the floor out of the insurance market and raise prices for the vulnerable. Even if Senate Democrats gun it, skid and fail, they may successfully turn the conversation. Rep. Martha McSally is getting support from heavy-hitters as early voting starts in Arizona Wednesday. 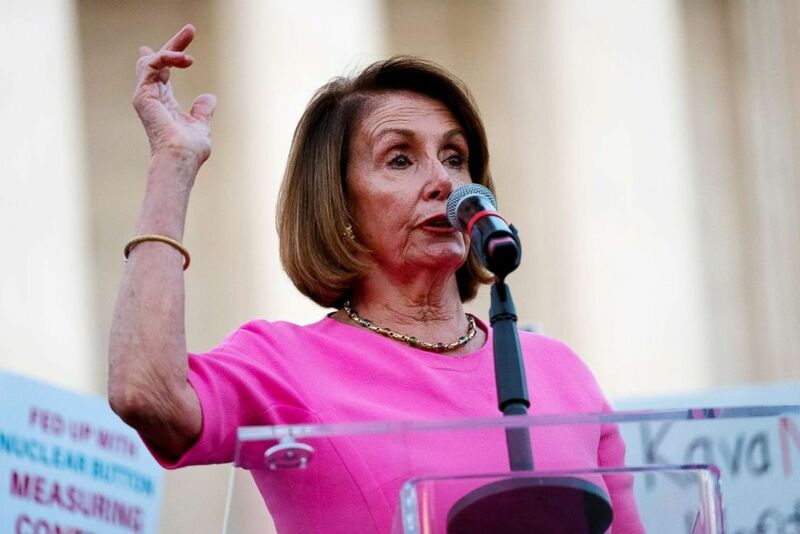 Her supporters got an email from President Donald Trump Tuesday in which he praises her "tough-as-nails leadership" and cites her backing of his border wall as a winning attribute. "I need conservative allies like Martha McSally by my side this November to protect our Senate majority so we can continue to put America First and extremism last," the email concludes. 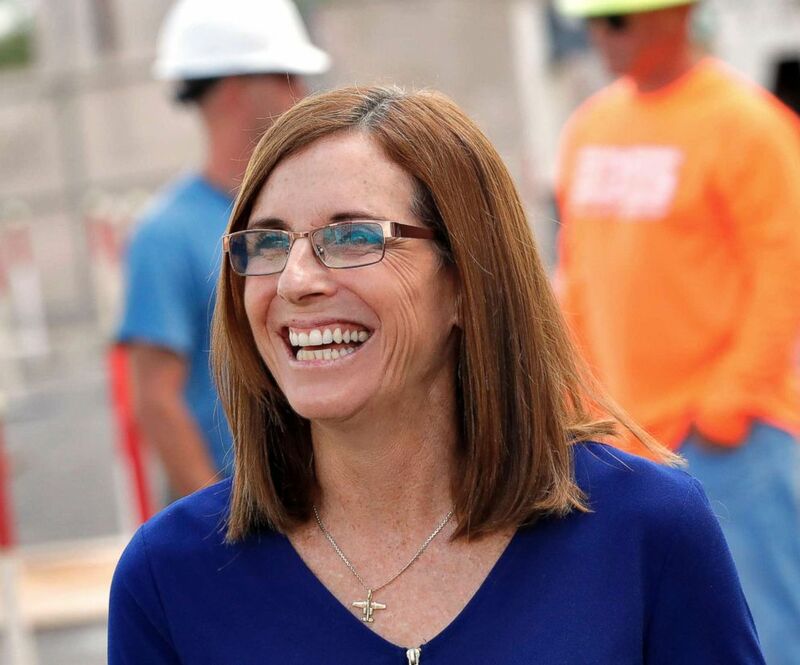 McSally is running against Democratic Rep. Kyrsten Sinema, who was leading, but within the margin of error, in the most recent NBC poll from late September. U.S. Rep. Martha McSally talks to tours at a crane manufacturing and training facility, , Oct. 3, 2018, in Phoenix. With under four weeks to go until Election Day and just five days until the only scheduled debate in this race, it comes as little surprise that some big names are making appearances on Arizona’s campaign trail. McSally’s campaign has confirmed that Mitt Romney, in the middle of a Senate campaign himself, will attend a rally for McSally in Mesa on Friday. And he might not be the only member of a Republican dynasty joining the mix. No comment from McSally’s camp on an Arizona Republic report that hosting a breakfast fundraiser next week will be none other than -- former President George W. Bush. The president travels to Erie, Pennsylvania, for his second "Make America Great Again" rally of the week. Trump will campaign for Rep. Lou Barletta, who's challenging Democratic Sen. Bob Casey in November. Trump has held over a dozen rallies in Pennsylvania, most recently in Wilkes-Barre. In Iowa, Republican Gov. Kim Reynolds and Democratic challenger Fred Hubbell face off in Des Moines on Wednesday in the first of three debates. It's a tight race, despite Reynolds’ being a Republican incumbent in a state Trump won by about 10 percentage points. On Tuesday night, the president campaigned with Reynolds at a "Make America Great Again" rally in Council Bluffs, Iowa. Republican Rep. Chris Collins and his son are scheduled for a court date Wednesday for insider trading charges. Despite the charges the congressman is running for re-election in his Buffalo-area district against Democratic challenger Nathan McMurray, a town supervisor in upstate New York. The Note is a daily ABC News feature that highlights political analysis of the day ahead. Please check back Monday for the latest.